9 IN THE MORNING, in the numbing cold and right after a snow storm, Lina Khattab’s family waits outside the military courts of Ofer prison in the West Bank. Families of prisoners gather around the yard fenced from all sides as they await their loved one’s trials. “Ha. Look at this, this is exactly like jail. The fence, the gate that is guarded, you can’t enter or leave without their permission you’re under their mercy. It’s exactly like jail” Lina’s father explains as he puffs on his cigarette. As everyone complains of the piercing cold, her father jokes with her uncle saying “if she gets released today you’re cooking meat, if not chicken will suffice.” Everyone bursts into laughter. A soldier approaches the fence, everyone gathers close to him hoping Lina’s name will be next. She wasn’t, and she wasn’t the one after. Lina’s court hearing was the last one in today’s military courts. Her family spent 8 hours in the cold waiting for their daughters hearing. Once it was time, 11 of us squeezed into a small trailer that served as a court house. Lina walks in, feet shackled, hair held back with a red head band and a smile from cheek to cheek. She kept blowing on her hands to stay warm, and every time she choked up or was on the verge of tears, she stared directly into the eyes of her family and smiled again. The prosecutor, not older than 28 stares everyone on the bench down. Never making eye contact with Lina she begins to explain how Lina should not be released on bail. As the defense presents their case, the prosecutor sits, legs crossed and begins to play with her phone. Her face expressing some form of disinterest in what is being said. She continues to play with her phone. Concurrently the translator fails to translate what is being said in Hebrew, instead Lina waits quietly and then asks her lawyer what is happening. An appeal to understand the mess in this kangaroo trial under the banner of justice. Lina has faced 5 court hearings so far without being charged. This 18 year old has been away from home for over a month and every time she has court she must go through a rigorous trip from one bus to another. Hidden in these buses are small cells with metal chairs and no light. The trip takes hours and multiple stops at various prisons. Usually beginning at 3 AM until her court date, which was at 5 PM. Lina, is not what she was made to be. 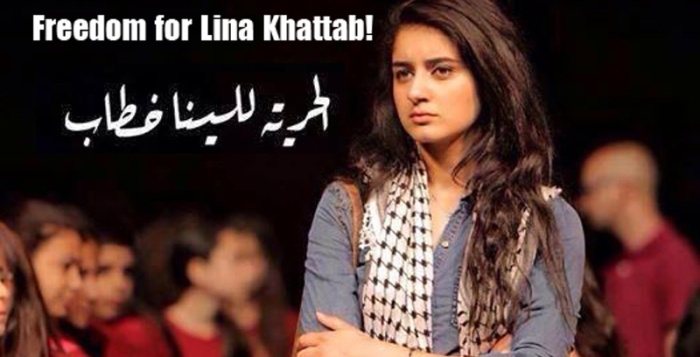 Lina is not simply the hero on the posters that were showered across social media. She is an 18 year old girl whom refuses to break down in front of the oppressor. She is a girl that dances Palestinian dabka and was in the beginning of her freshmen year at Birzeit University. Lina, sweet Lina. In a jacket too big for her small body and black hair held back. Lina with the radiating smile, sweet Lina that kept reassuring her parents that she is okay only to turn around to hold her tears back. Sweet, Lina. 18 year old Lina in an unjust system that hides behind the façade of democracy. Walking out, Lina’s mother attempts to hug her daughter. Small Lina, drowning in an oversized jacket tried to hug her mother back, but soldiers pulled her away and her mother was able to get a touch of a cold palm. As we leave the trailer and Lina is shackled by her hands her mother and sister shout “did you get the clothes we sent you, Lina?! Ask for them! We sent you clothes, are you warm, Lina?” Before she can give a proper answer she was taken away by two female soldiers. Whilst we all walk towards the exit of the prison, Lina is taken to jail cell number 1 at Ofer, where she will wait for a bus ride back to Hasharon. The cells are designed to be exceptionally cold and unhygienic. There is only one concrete bench that circles the room and walls engraved with names of former prisoners. Lina’s next court date is on the 18th of January. As her parents wait outside the courtrooms once more, Lina will again take another trip only to be faced with a judge that has already decided she is guilty and is simply attempting to find some sort of rationalization to explain her continued incarceration. Previous Post The war is not over. This is heartbreaking. And she has not been charged for anything? Where’s Shireen Issawi? Still in unhealthy isolation? Today 316th day of prison. Abandoned by all? Buried alive?